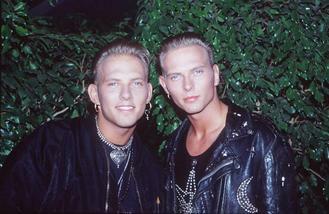 Matt and Luke Goss' Bros comeback has been inspired by their late mother. The 48-year-old twins recently announced their return to the music industry following a 24-year break and have revealed that the loss of their mum Carol in 2014 was the reason behind their comeback. Matt explained: "We lost our mother. That took a great toll on both me and my brother. "That is the day you truly become men. What it has done is made us very deeply realise that we are such a family. "You mess with my brother, you mess with me. We're proper double trouble. "It's a beautiful thing to have each other's back in the way we do. And that intensity will make its way on stage too." Luke explained that his mum's death was especially hard to accept because they are such a close family. He told The Sun newspaper: "We have a very small family so when you lose people you love - sister, our mother, grandfathers who raised us with our mother - you start to put great value on it. "Family has become a priority now." Meanwhile, Matt admitted that his mum's death nearly sent him over the edge. He shared: "There have been times when it's been dark. "I had to make a decision when mum passed, I was either going to spiral out of control into nothingness or honour her blood and teaching, which was, 'Stay strong and keep moving, left foot, right foot, but remember to dance along the way'. That's exactly what I've done. "Then I've come together with my best friend. Luke is my best friend and I trust him with my life." The 'When Will I Be Famous?' hitmakers will return to the stage in 2017 at London's O2 Arena for a reunion concert. Singer Meghan Trainor and actor Daryl Sabara have sparked dating rumours after they were photographed shopping together. Rapper Drake is "crushed" after having to postpone three upcoming tour dates due to an ankle injury. Meek Mill's life with Nicki Minaj is so perfect he often feels as though he's dreaming. Lady Gaga's new song 'Just Another Day' was inspired by David Bowie. Singer Nicole Scherzinger fears her career has cost her the chance to start a family. Charlie Simpson has rejoined Busted. Taylor Swift will help kick off the celebrations for the 2017 Super Bowl by headlining a pre-game bash in Houston, Texas. Chance the Rapper anticipates recorded albums will soon become a thing of the past. Sting won't reunite with The Police again.